Are you looking forward to the camping season as much as we are? If so, we’ve got some great tips to prepare your RV that can help you get ready and camp safely. This is a great time to do your annual RV spring maintenance and protect your investment. You can prolong the life of your RV by doing these simple routine maintenance items. If you don’t feel comfortable doing any of these items our service department would be glad to help you! Just give us a call to schedule an appointment. Clean terminal connectors and check for corrosion. Check battery water level and be sure to use only distilled water. Sanitize your RV water system and check for leaks. Add potable water to the fresh water holding tank, turn the water pump on and open all of the water faucets. When the water is running clear through the system turn the pump off and close the faucets. Take the water heater out of the by-pass mode (if applicable). If the water heater wasn’t bypassed before winterizing the unit, the antifreeze needs to be drained from the water heater tank. Replace any water filter cartridges you removed for storage. Your RV tires can lose 2-3 psi a month while sitting in storage. Be sure to check for wear and tear on your tires. Adjust the inflation pressure to the manufacturer’s recommendation based on the load. Failing to maintain correct tire pressure, based on the load, can result in fast tread wear, uneven wear, poor handling, and excessive heat build-up which can lead to tire failure. Tire manufacturers publish load and inflation tables that should be followed for proper inflation pressure. Check the operation of all LP gas fired appliances. Make sure the water heater tank is full of water before testing the water heater. If an LP gas appliance is not operating properly, have it inspected by an authorized RV service facility. Insects are attracted to the odorant added to LP gas and they build nests that can affect the appliance from operating properly. Note: The LP gas system should have a leak test and LP gas operating pressure test performed annually. These tests should be performed by an authorized RV repair facility. Check the transmission, power steering, engine coolant, engine oil, windshield washer and brake fluid. Consult your vehicle owner’s manual for proper levels. If a fluid level is low, try to determine why, and correct the problem. Service the engine and engine fluid levels according to specified intervals found in the vehicle owner’s manual. Start the engine and check for proper readings on all gauges. Check the operation of all lights. Make sure your vehicle emissions and inspection sticker are up to date. Check the oil level in the generator. Service the generator according to specified intervals found in the owner’s manual. Inspect the generator exhaust system for any damage prior to starting. Never run a generator with a damaged exhaust system. If you didn’t exercise the generator during storage, start and run it for about two hours with at least a half-rated load. Check your generator owner’s manual for load ratings. If you didn’t use a fuel stabilizer and the generator won’t start or continues to surge after starting, have it checked out and repaired by an authorized service facility. Inspect all roof and body seams and around any openings for signs of cracking or damage and reseal if necessary. Consult your RV owner’s manual or ask us about sealants compatible with different types of materials. If you don’t feel comfortable performing the inspections or repairing seams and sealants, we can do it for you. Test the operation of the smoke alarm, carbon monoxide detector, and LP gas leak detector. Inspect all fire extinguishers to make sure they are fully charged. Make sure that you and your family members know how to use a fire extinguisher. Everyone should know the symptoms of carbon monoxide poisoning and what to do if you are exposed to it. 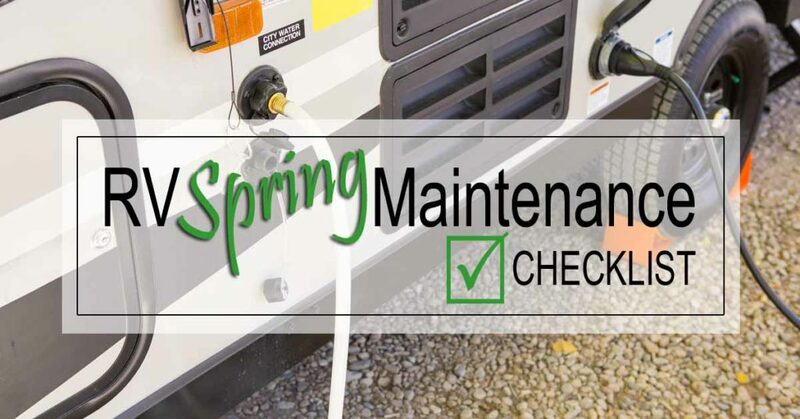 This is a very basic checklist to jump-start your spring RV maintenance, but for more detailed information check out this e-book written by Mark Polk for RV Education 101, RV Checklists – The Original Checklists for RVers. This book includes all the checklists you will ever need for your RV! Applicable for pop-ups, travel trailers, fifth wheels, and motorhomes. It includes checklists for pre-delivery inspections, basic inventory, tools & supplies, getting there safely, campground set-up, pre-trip, home security, dinghy towing, essential Items, nice to have items, traveling with pets, awning operation, winterizing and de-winterizing your RV, storing your RV, battery testing chart, spring prep, and much more. Do you have any tips you would like to share about prepping your camper or RV? We would love to hear from you.